"Designed and developed in accordance with international industrial standards for Retail Jewellery Stores , Goldscope is basically a type of an X-ray fluorescence measuring instrument with SI- PIN Detector optimised for non-destructive analysis of the gold and silver alloys along with detection of Powder such as Iridium, Ruthenium . It can easily analyse the Gold and indicate values in carat or weight%. 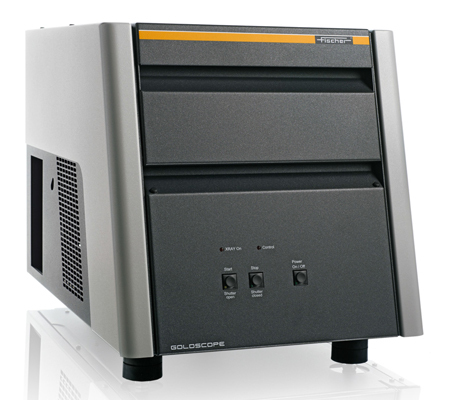 Goldscope is a Cost-effective and compact entry-level X-Ray Fluorescence (XRF) Measuring Instrument for fast and non-destructive Analysis of Gold and Silver Alloys"
The unit is compactly designed as user-friendly bench-top instrument. It is light in weight and require less space. The door of the instrument opens in the front not upwards thus saving more space. The lower chamber possess detector assembly and X-ray source which helps in easy positioning of sample in the instrument. Its precise measuring spot adjustment is the result of the integrated video-microscope with zoom and cross-hairs, which simplifies sample placement. The system is operated through powerful and user-friendly WinFTM® software for the entire operation and evaluation of measurements as well as the clear presentation of data using PC. Design: Goldscope: Bench top unit with towards the front opening hood. Approval Individual acceptance inspection as a fully protected instrument according to the German regulations "Deutsche Röntgenverordnung - RöV". simplified measurements at varying distances. For particular applications or for higher demands on accuracy an additional calibration might be necessary.